From beloved author-illustrator Henry Cole comes the stunning follow-up to Spot, the Cat. In this beautiful wordless picture book, Spot the cat finds a dog named Dot who’s off on her own adventure through the city! 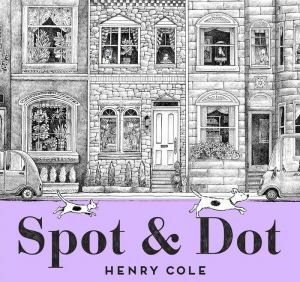 In Henry Cole’s vivid wordless picture book Spot, the Cat, readers joined Spot on a journey through a city that began with him following a bird outside his window. This time, a dog named Dot draws Spot from his window. As we follow Spot and Dot on their wordless journey, we quickly realize that it’s Dot the dog who is missing this time, and Spot is trying to get her back home. We follow these two on a different journey through the city as they weave in and out of a bakery, a library, a busy park, and more. And with a surprise twist at the end, we realize that “home” for both cat and dog was never very far away. With detailed black-and-white illustrations, readers will love following Spot and Dot on their adventure and cheering for the sweet reunion at the end.